Hey, you! Yep – you, the one eating peanut butter out of the jar with your finger and then trying to get it out from under your nail. I know what you're planning to do after work tonight. You're going to go home, trawl Buzzfeed or The LAD Bible for a while, feed your goldfish, cook yourself a nice, healthy dinner and then polish off the tub of icicle-ridden Sara Lee lurking in the back of your freezer, all while re-watching episodes of Big Bang Theory after you've Googled all the jokes to make you feel like a smarty pants. Alone. Did we hit a nerve? Good. We do this because we love you, Listers! It's time to change up your routine! Swap your PJs for pinots or pints, text your friends (Tinder dates don't count), and round up a group for some good old-fashioned fun at an actual bar. Who cares if you spend money you don't have, write your number on a $5 note and give it to the bartender, or end up singing an off-key rendition of You're The Voice with all the passion you could muster at 1am, odds are you'll get a good story out of it! We know that asking you to spend a night away from the couch and Candy Crush Saga is an ask, but you might end up having fun… Maybe. If not, why don't you let someone plan a night out for you? The experts at Winger know how to plan a fun evening, and can even match you with similarly attractive (read: bangin') humans such as yourself. They'll even throw in a free drink – now we've got your attention! A great atmosphere, cocktails galore and the perfect rear courtyard to make use of as the weather warms up, Jekyll & Hyde offer you and your mates a great spot to kick back and battle it out over whose shout it is. When you inevitably get peckish, dig into the tapas plates, or go for something more substantial in the spirit of sharing; you just can't go past that charcuterie board! Button Bar's hint of a pirate theme invites you to spend your dubloons on round after round of drinks, nautical puns compulsory. You may have a hard time finding the entry, but once you make your way in, be prepared to marvel at the sheer magnitude of the back bar. Make use of their collection and order one of their signature cocktails, partake in a few bottles of wine for the table. You may think you know Mexican food and cocktails, but you're definitely in for a new experience if you're headed to Mr. Moustache in Bondi. With a clean interior and open kitchen, things may seem like your average bar, but they're not. Enter with your mates and be prepared to get lost in the world of mezcal, authentic Mexican food and some of the most innovative cocktails you'll ever have. You can thank us later! Everyone loves a little quirkiness when they head out for a few drinks with mates, and when we heard there was a bar with a My Little Pony mural in the bathroom, we simply had to investigate. The Pony Room offer plenty of plush couches to relax on while enjoying a cold beer, bottle of wine or cocktail. It's just so easy to lose track of time while listening to old school hip-hop, fighting over the last slice of pizza, and sipping on a negroni in good company. Bondi isn't just hipster-town, the guys at The Corner House offer professional service and some great banter from their side of the bar. When it comes to a spot for a good group hang, nothing beats a few beers, wines or cocktails, maybe with a wood-fired pizza or small plates, of which The Corner House have plenty. Be sure to check out the nightly special for some innovative Italian-style eats. Yes, we're going to talk about that cheeseburger again. Any excuse will do to head down and sink your teeth into that hunk of meat that drips with cheese and…. What were we talking about? Right, drinks. Aside from its smouldering temptress of a menu, partake in one of Brooklyn Social's 40 types of gin, or maybe just a few beers. Either way, the vibe is great and the music is awesome, just go. Locals got a little bit excited when SoCal opened its doors in 2013. Offering a light-filled indoor and outdoor space with great music, flowing drinks and fresh food, there is almost too much to love about SoCal. If you're looking for refreshment, look no further than the Lambda Largerita, their signature margarita with a full Corona mixed in – being double parked never felt so good! Be sure to sample the snapper ceviche if you're hungry – it's a winner. Here's one you may not have heard of, but we bet our hats you'll be a regular after just one visit. Hidden in the heart of Chippendale, Zigi's Art Wine & Cheese Bar offer an incredible selection of wines from all over the globe, a fascinating menu of Ausraeli cuisine, and more cheese than you have ever dreamt of. 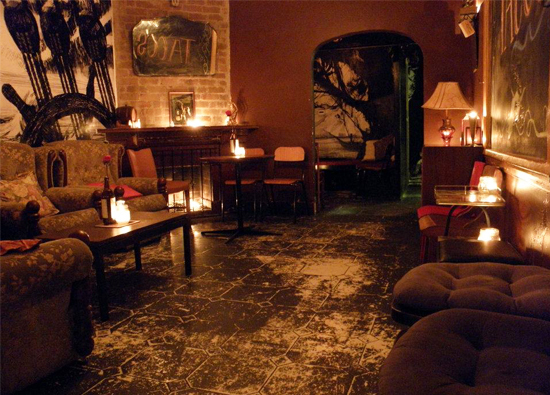 The dark, intimate space is perfect for meeting with mates or making new ones over many, many drinks. The kitschy-meets-cute décor, drinks list and food menu designed for sharing at The Cottage Bar & Kitchen creates the perfect atmosphere for drinks with your closest. Designed to feel welcoming and look like your grandma's farmhouse, we recommend you grab a seat in the fairy light-strewn courtyard or huddle inside. Either way, you'll want to tuck into a few share plates or dabble in a pizza from the enormous oven. It would be rude not to sample a cocktail, and the punch bowls are ideal for larger groups. Have a couple of mates but need some dates? We may have found the solution to your social life woes! Why not grab some friends and go on a Winger? It's a brand new invite–only social club you should totally check out. But click quick! It's first in best dressed.